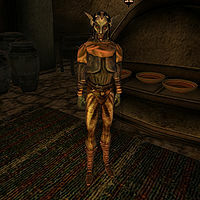 Tiras Sadus is a Dunmer trader located inside his store in Ald'ruhn. He is one of several merchants in the city who has a problem with Ienas Sarandas's outstanding debts. He is missing payment for a racer suede belt. This page was last modified on 19 August 2013, at 04:00.